Catch a frontside wave with some power and a nice lip. A crumbly mushburger won’t do it for this trick. Look for some speed! You need just a little bit less than you would for an air. Start your bottom turn out on the flats. You want to accelerate through the bottom turn, and use your body like a spring to crack the lip and kick your tail out. Get low and put your trailing arm in the water for balance and leverage. Really lean into it. You should always be looking at the section you want to hit, even before you do your bottom turn. Bottom turn at a 75 degree angle to start and as you get more and more comfortable go as straight up as you can. As you turn up the wave your body will want to extend. Don’t stand straight up and get all stiff, just try to do what feels natural. 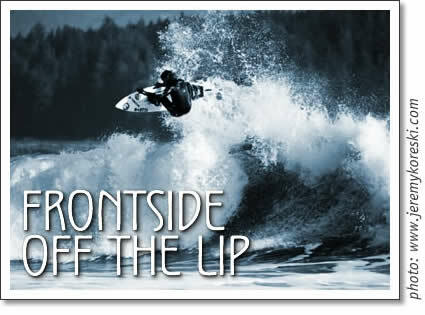 Open your shoulders into the turn as top half of your board comes over the lip. The difference between a normal reo(re-entry) and a fins out reo is in how long you wait before you change direction and kick your fins out. Opening your shoulders will initiate the reo, and pushing out your back leg will turn it into a fins out reo. Keep watching the lip ahead and below you as you pivot over the middle of your board on the lip. Timing and balance are very important at this stage; If your weight is too far back you’ll fall backwards off of the lip onto the flats and your board will land on top of you, and if you’re weight is too far forward or you turn to late you’ll be left out the back of the wave. You want to end up with the lip in between your feet with your back leg extended, and pushing through the turn. Your front leg should be bent in a straight line over your body, from your leading shoulder to your knee, over your front foot. Stay low and go with the flow as your board pivots. Try to look at the transition of the wave so you can get ready for your decent. As the lip starts to fall you will hopefully be going with it. If it’s a heavy section step on your tail in preparation for an air drop; if not cruise back into the wave and hit the lip again. Taj Burrow calls these the frontside waft in Globes new, “TB’s Book of Hot Surfing,” and if you’re serious about your surfing you should pick this book up. It has everything from waxing your board to 360 airs. Mick Fanning and Parko are a few others who do these well. Tofino surfing: Frontside off the lip - Tofino surfer Pete Devries explains this surfing move in Tofino Time Magazine.